Cheese – dairy product made from soured milk is very beneficial for human health. Most Housewives prefer to buy it in stores or markets, but if you cook it yourself, you can be sure of its quality and freshness. For preparation of curd only need milk: you can take fresh, but best of all is sour. As the basis of cheese is the milk, it depends on its quality taste, useful features and the quality of the final product. If you do the cheese not sticking to these rules, it is possible to not simply useful, but harmful and even dangerous product, as it may contain microorganisms. Therefore, it is desirable to take store-bought pasteurized milk, which is already processed and safe for health. If you want to make cheese from raw milk, it needs to be processed carefully to boil. The milk should turn sour in the indoor environment, then it will turn into yogurt after a day in warm weather or three days during the winter. If you add a bit of black bread, the process will go faster. Do not stir the milk until it sours. The longer the milk turn sour, the sourer it will curd. But if you neoclassici the milk, then the cheese will be tasteless. If fresh milk, another important ingredient in the process of making curd is sour. It is advisable to take a real cheese starter culture, but you can use yogurt or sour cream. Yeast add the warm milk and leave in a warm place to souring. Take a clean cheesecloth, a colander and a saucepan. You can make a special linen bag in the form of a cone, it is more convenient to use than gauze, which also need to constantly change. Separate the upper oily layer with sour milk, pour it into a saucepan and place on low heat, bringing to 50 degrees. By this time the milk will split into curds clot and serum. It is very important not to digest the liquid, otherwise the cheese will turn hard like rubber, especially not to boil sour milk. Put the gauze in several layers in a colander so that the edges hung over the sides, put it in any container and pour the resulting mass in a colander. 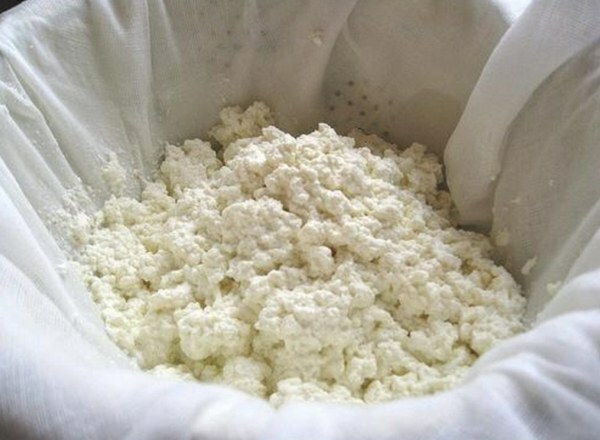 Hang the gauze, rolled into a knot, or a bag with a bunch at night over a bowl so that the whey was drained. The serum can then be used to make pancakes or a drink – it's great thirst quencher. After a few hours you can squeeze the remaining whey, putting the bag of curds into the press. The result is a delicate, crumbly, fairly moist cheese, which, like all homemade products are tastier than store-bought. The longer you hold the pouch under pressure, the drier the work product. Homemade cottage cheese stored in the refrigerator no more than two or three days, the most delicious fresh it when freshly cooked. 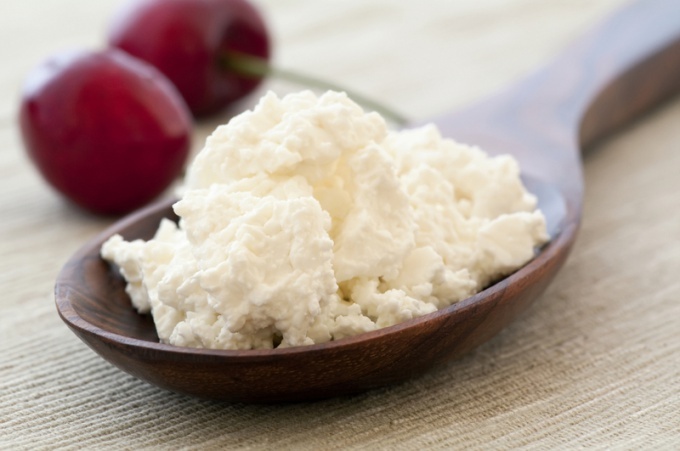 Cottage cheese is much healthier that is sold in stores, because it does not contain all kinds of additives, which are composed of most of the proposed options in supermarkets. To prepare the curd at home is a snap, however this procedure is not fast. - two tablespoons of sour cream. Pour sour milk into a glass jar, add two tablespoons of thick cream and stir. Cover with jar lid or a piece of gauze and put in a warm place for about 12 hours (during this time, the sour milk to turn into yogurt). It is worth noting that the sour cream in the dairy product does not necessarily add, but this greatly accelerates the transformation of milk into yogurt. As soon as the milk product in the form of curdled milk is obtained, you can proceed directly to its heat treatment. To do this, carefully pour the curdled milk into the bowl of the multicooker, close the lid of the device, then select the "heating" mode for approximately 60 minutes. If the same way to heat sour milk, the milk will simply curdle. After some time open the lid multivarki and check the condition of the product: if the serum separated is not enough, then continue heating another 30 minutes, then allow to stand at least one hour. Take a large enough piece of cheesecloth, fold it over to make at least four layers, lay the cheesecloth in a colander and pour the contents of the bowl multivarki on the gauze. Carefully take the cheesecloth by the edges and hang the bag to drain excess liquid (whey). Healthy and delicious curd in multivarka ready. To get more dry and crumbly product, you need to wrap the cheese in cheesecloth and put under pressure for 12 hours.